Lisnard aims to prohibit "beachwear ostentatiously showing a religious affiliation while France and places of religious significance are the target of terror attacks," the Independent reported. To make matters worse, Cannes' Head of Municipal Services Thierry Migoule made the unfair connection with Muslim women who wear the burkini to those who pledge allegiance to terrorist organizations. "We are not talking about banning the wearing of religious symbols on the beach... but ostentatious clothing which refers to an allegiance to terrorist movements which are at war with us," Migoule told AFP. This couldn't be clearer religious discrimination nor could it be more ridiculous. Since when are burkinis, swimwear that covers the entire body and the hair (not the face like actual burqas), associated with terrorism? I've never heard of terrorist attacks on beaches. 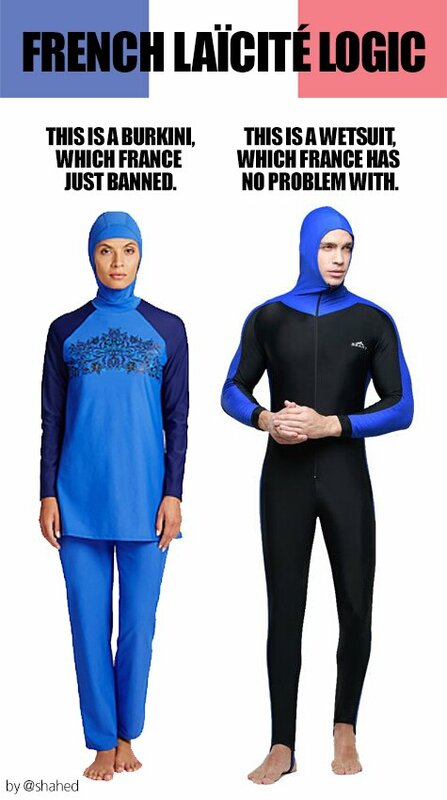 I've never heard of a Muslim women in a thing that is essentially the same as a wetsuit committing an act of terror. You know, except for scaring Islamophobic white people by existing. My fellow white feminists need to immediately stop defending this ban and speak out against it. They need to stop equating head coverings with misogyny, especially because they're constantly focusing on Muslim head coverings and not those from other religions and cultures. It's making things terrifying for Muslim women in places like France. Islamophobia is escalating and becoming more and more violent. As the Mic article points out, this policy is clearly targeting Muslims only. This cannot be tolerated.